The city shrouded in mist, the enchantment materialised. Strange cold creamy flat light past the Abbey and up to Queen Square. The first great iconic architectural project of Georgian Bath. At once admiring its formerly austere grandeur and thinking of Dabydeen’s idea of triumphalism we looked for house numbers and plaques. I checked the sun sign supposed to ward off witches on the wall of the haunted house, the polished brass of the solicitors and at the end of the top terrace, entwined in creeper branches, number 21. Residence of George Weare Braikenridge, slaveowner and antiquarian, memorialised for the latter. A crowd of tourists towing bipperty bopperty suitcases on wheels trundled past. On up Gay Street, two slave owners residences identified there, and into The Circus. The first time in a long time I have walked around the circle with its strange masonic hieroglyphs, it felt dark and oppressive. Here slaveowners residencies their names un-plaqued neighboured heroes of Empire: Livingstone, Clive of India and others unremembered but materialised in dark metal oblongs. 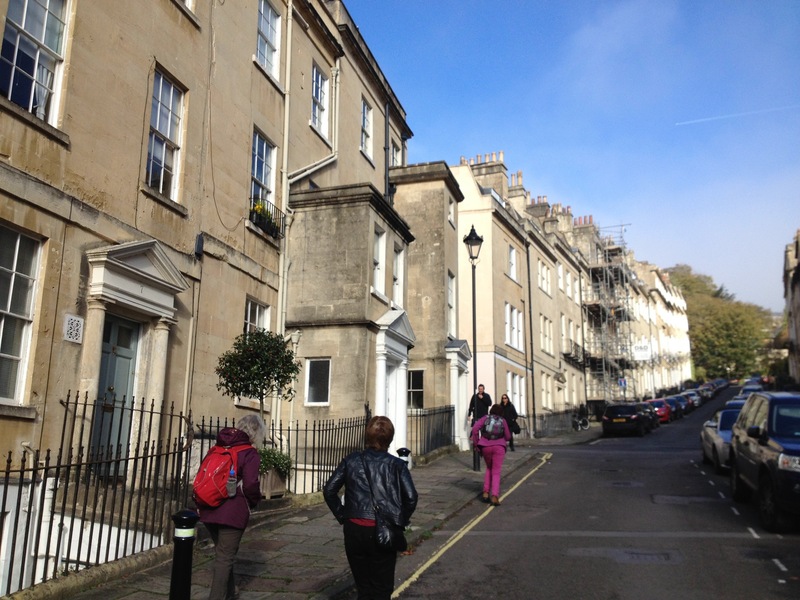 A coach purred past and another disgorged its tourist load to walk towards the Royal Crescent. I heard a shout of my name, a fellow walker arriving late had guessed that we might be heading to this part of the City. For those who want to follow the money into the foundations of this architectural wonder, the signs are clear. Its the detail we are trying to reveal as in the detail we find human lives. On to the Royal Crescent it vast curved expanse looking out into mist. Some of these houses were social housing not so long ago. Family silver sold off. From the future and across the globe we were arriving asking questions and raising sensibilities about power and wealth. History catching up on the past, knocking on the door of the present. 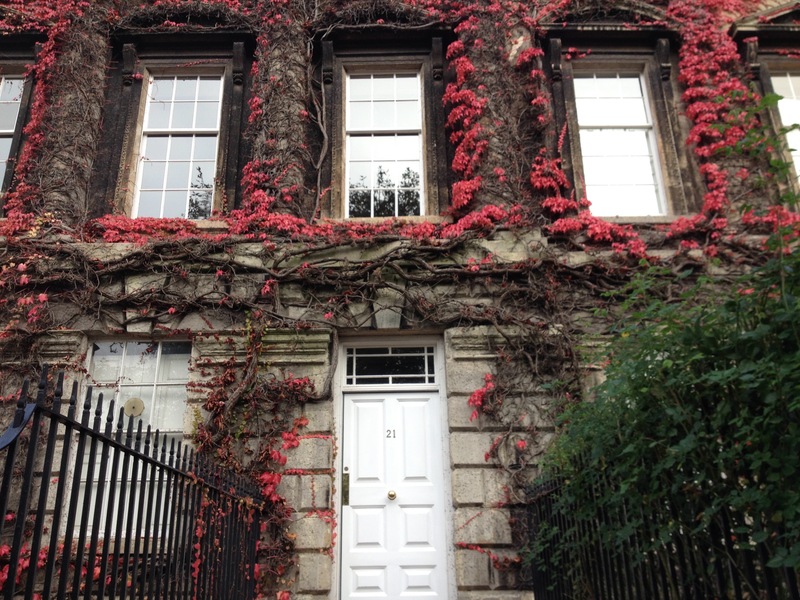 The legacy in Bath of transatlantic slavery seems so silent…but then who would want a badge on their door saying “James Markland slaveowner and advocate of slavery lived here”. On Park Street we identified the home of one Nathaniel Wells, his mother, Juggy, an enslaved house servant; in 1837 he received £1400 9s and 7d on the basis of the ownership of 86 enslaved people on St Kitts. Maybe he owned his mother? Despite his African heritage, I read, he was accepted into the elite society of Monmouthshire, and even before this payout, was the Sheriff of the County. The layers and complications of the story and our mission multiply. An enchantment has many layers, the story of a mixed race slaveowner retiring to Monmouthshire intrigued us. Looking up to the roofs and parapets of Park Street I remembered my return from distant lands to a lost love. This too was social housing then. Climbing out of the former servants bedroom window and sitting before a low wall, the enchanted city lay below us. Not quite renewing. Remembering a view, sustaining a moment of affection. An encounter with a man puffing, redfaced on his way back from the gym brought us back to the moment, he told us of a black man painting the railings and how he had identified the decaying and uncared for house opposite as a slaveowner’s residence. I checked the email he gave me but doesnt connect. 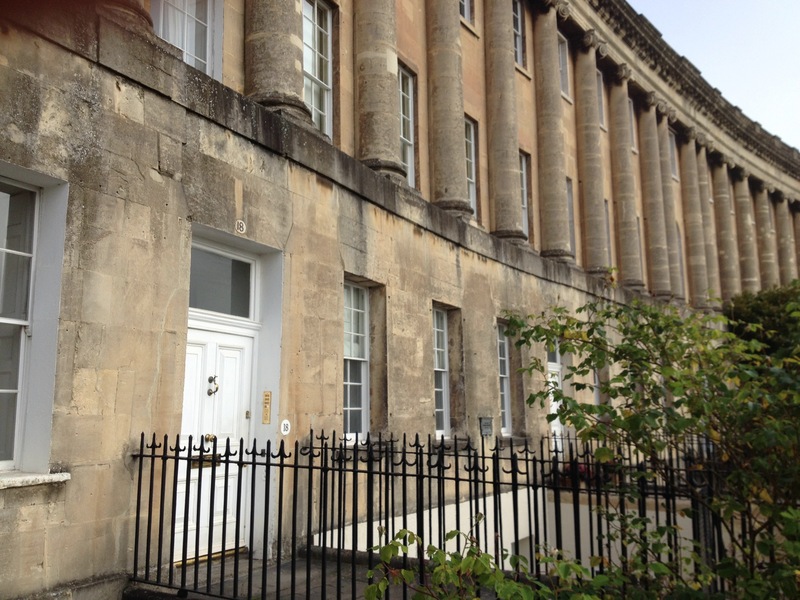 Through the green below Lansdown Crescent along to the residence of William Beckford himself memorialised in standard dark oblong metal plaque…no mention of the origin of his wealth….but then why would you? Plaques for places are one thing plaques for people are difficult. How are guilty secrets memorialised. Does Hitler’s house have a blue plaque? Mosley? Enoch Powell? Where to begin and end….some have plaques but their crimes go unmentioned just as others have plaques and the origins of their wealth go unmentioned. A New Zealand Maori idea that we balance on the shoulders of all those who went before us, ancestors good bad indifferent are part of us and make us. All of us. The mists settled. We walked past the old Art School buildings at Sion Hill, the clean arc of Somerset Place now preserved like a museum sculpture, sterilised of student creativity that occasionally challenged its triumphalism. 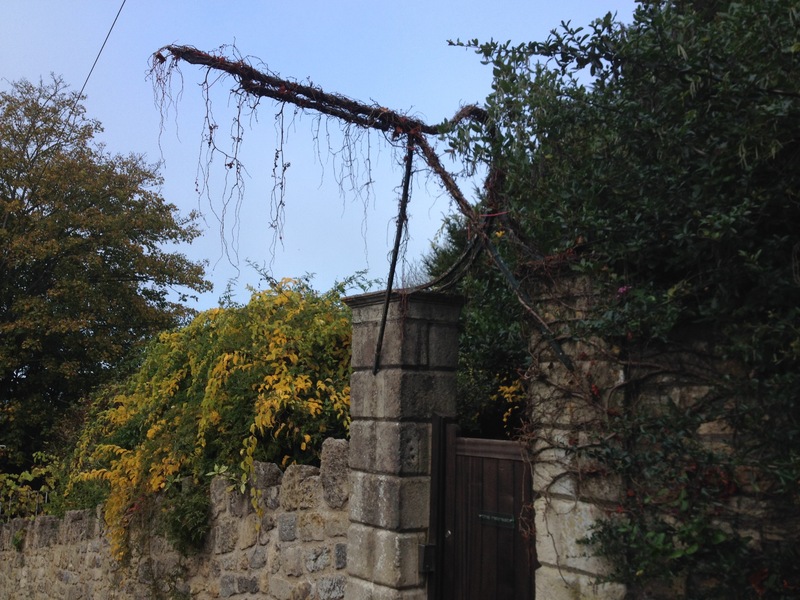 To the beginning of the Cotswold Way our enchanted path into the English countryside, down steps and slippy leaf slopes, under the gibbet of an old pub sign, des res home now the sign no longer swinging in the breeze. Down yes down further to the brook and at last out into fields. A feeling of release. Magpies. A keening buzzard hunting. Farmers warning to unwary/unwelcome? walkers. 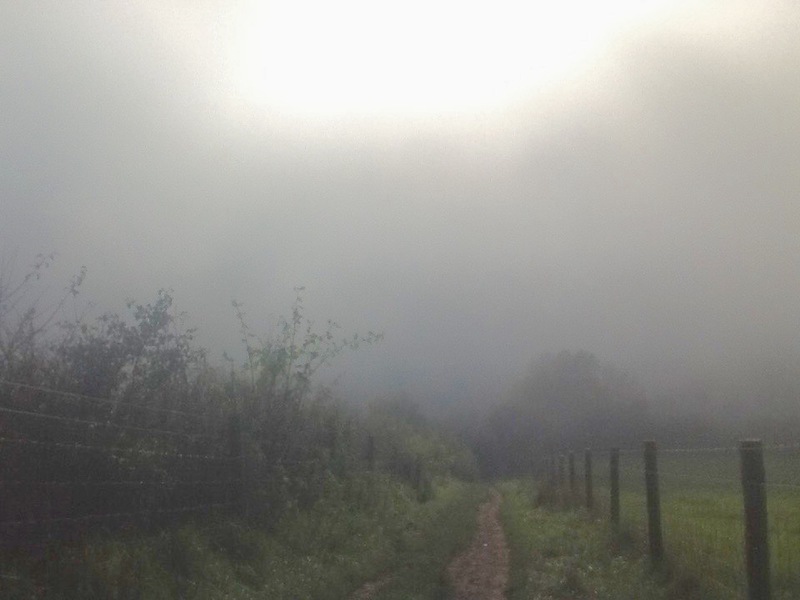 We walked up into clout, mist enveloping us. Cloaking the City below. Concealing the tower ahead. 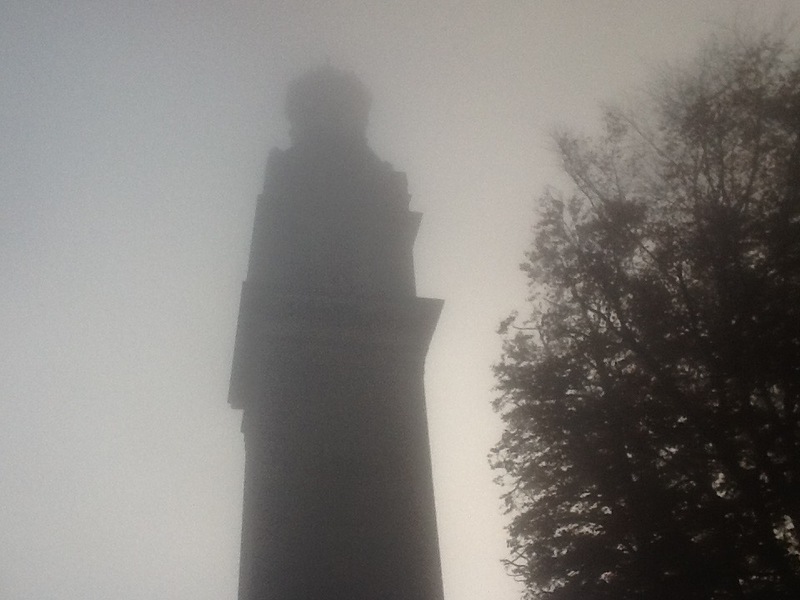 Beckford Tower barely visible in the mist, atmospheric cemetery below suitable Halloween conditions, although it was the day after. Sexuality and slaveownership glossed here but the stories told for those who asked. Us. More on Beckford’s Tower and the Hare and Hounds another time. The questions on how to memorialise remain. A plaque seems increasingly not like a good idea…its not a judgement on the people who live in those houses now. But how to locate the stories, the followthemoney and bear witness to the misery and horror in popular consciousness. How to make the contemporary connections. A performative walk in witness, a sharing of knowledge without blame and shame for those who live there now. A motif. A reconciliation with the past that may help us with the present. Thinking more on this and I would welcome feedback and contributions. Next time we stay in the city and maybe look for ways of breaking out of the enchantment from within. Tags: Bath, enchantment, followthemoney, memorial, slaveowners, slavery, walk | Permalink. With the footsteps of your walk in mind, and our footprint perhaps on the shoulders of (all) those who have gone before, a fitting memorialisation could take the form of stencils on the pavements. Transitory maybe (but documentable) but no less relevant because of that. I have heard of, but not seen, powerhosed pavement stencils. And for imagery perhaps William snr’s ‘Liberty’ banner. Was at the tower before the disenchanting cold fog rose from the valley, following a reference to the Walk from a contact at the Theaster Gates’ resonant event in Bristol. Thank you.